Ghostwritten is a globe-spanning novel with ten main characters who are connected by some very strange coincidences. Things start with a gas attack in Tokyo, but over the next four hundred pages things take some very strange turns. If you want a novel that’s unpredictable and varied, this is it. As always, Mitchell’s writing is just plain gorgeous. He could describe a man waiting in line at the post-office and I’d be hooked. His sentences are funny and expressive with light and easy rhythm. Observations which other writers could make sound trite never come across as simple because of their place in such an unusual narrative and thanks to his flair on a sentence by sentence level. Some of the most fascinating stuff takes place in Mongolia, where an incorporeal being of some sort is floating from host to host, struggling to understand where it came from. That such a strange idea works so easily is a testament to the way Mitchell can, when he is careful, take you in directions you had never thought of while still satisfying traditional story needs. Stories slide from realistic to fantastical on a whim, with Mitchell disregarding traditional notions of genre. Despite the disjointed tone and themes, things stay feeling grounded even when events are plain impossible. Unfortunately, while the final quarter is still powerful on a moment-to-moment level, there are simply too many disparate threads for the novel to satisfyingly tie everything together. Unlike Cloud Atlas, which felt like a very cohesive whole, all the sections of Ghostwritten felt more like fascinating short stories which happened to have connections with each other, rather than as different parts of a cohesive whole. The world-ending plotline felt tacked on to let things end with a bang and add a sense of grandeur instead of giving thematic weight. None of this is helped by Mo Muntervary getting introduced near the end. She has a vital story when it comes to the overarching narrative, but is also the least convincing character. Her chapter came across as an excuse for Mitchell to talk in physics metaphors and exposition in a hasty attempt to set up the finale. I’m still glad I read this though. 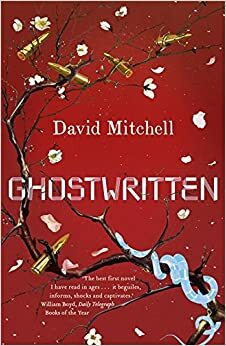 Ghostwritten is an imperfect gem, with fascinating character work and prose. It’s just a shame it never quite blends together as a full novel.